Mikey and I took a run down San Diego way a while back and were looking for another great place to review. Luckily, this time I did a little thinkin’ ahead and called my friend Talia, to pick her brain about where I could find some delicious pizza. She let me know that Pizza Port was, hands down, the best pizza in all of San Diego. And with a recommendation like that, how could we not go check it out? Some of you might have noticed that it’s been a while since we did our last pizza review. The reason for that isn’t the fact that we started hating pizza, but instead that Mikey and I have been struggling to find places that live up to our rigid standards. Pizza is the only thing on the site that we rate (a la Zagat) and, so far, we’ve yet to have a pizza crack 80 on our 100 point scale. (Otherwise known as the Pizza Measuring System or PMS) Our last pizza was the highest scoring yet and it only managed a 76. The first thing that I have to say about this place is that the location is perfect. It certainly didn’t hurt that it was 88 degrees and sunny. Oh, and there were about a gazillion beautiful women walking around which definitely added to the ambiance a little. But the real surprise was how cool everyone was. Mikey and I probably met about 10-15 people while we were sitting there eating and drinking away and not one of them was douchy in the slightest. So we made our entrance and were immediately confronted with tough decisions. Not with what pizza to get (since we always order the same thing), but with which of the microbrews we were going to drink first. I’m a fan of the hoppy brews, so I went with their award winning Swami’s IPA, while Mikey got a Commando Scottish Ale. The hops in the Swami’s was more intense than any IPA I’ve ever drank. It ended up being a little too much, even for me. Don’t get me wrong, it was fantastical. It’s just that for such a hot day, I needed something a little lighter. 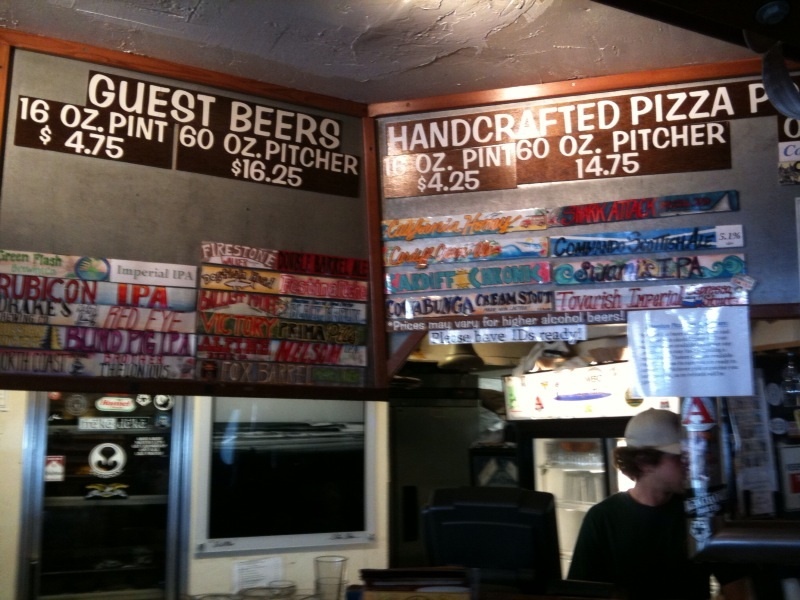 Another great thing about Pizza Port is that they brew their own beers in-house. 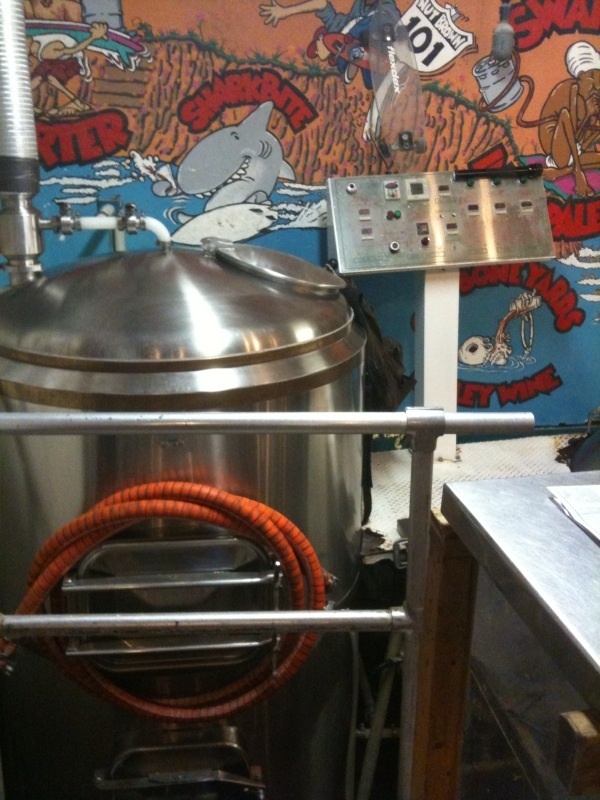 Because I love you guys so much and want you to be happy, I made it my persoanal mission to sneak back and get a picture of their top-secret brewing area. So Mikey and I settled in with our beers and prepared for a long wait. Instead, our pizza was out within 15 minutes, which I thought was pretty impressive considering the number of people who ordered ahead of us. As it turns out, we hadn’t seen busy. Later that day, the crowds swelled until the point that you could barely move through the restaurant. I’m just estimating, but there were easily 20 people waiting for takeout at any given time. So let’s get down to brass tacks. Was the pizza any good? Hell yes, it was! Mikey and I differ in opinion on some of the details, but we both agreed that it was the best that we’ve reviewed so far. Rather than write it all out in nice little paragraphs, I’m just going to give you our opinions on each category. Mikey took points off because he got a couple pieces that had some residual flour on the crust. I didn’t have the same issue and thought the dough was both crispy and chewy and cooked just the right amount of time. We both agreed that this was the first pizza place to give us enough sauce on our pie. We had just about lost hope, but here comes Pizza Port to save the day. Not only was there enough sauce, but it was also pretty unique, having a tart and tangy flavor. Mikey deducted points here because he didn’t think that there was enough cheese. I thought the amount was right on and based that opinion on the fact that my toppings stayed glued to the pizza for the most part. It wasn’t the best cheese I’ve ever had, but they added some herbs to it that put it into the above average category in my book. Despite the scores, this was the best part of the judging for both of us. First of all, we both agreed that the sausage was the best out of any pizza we’ve judged thusfar. Our main complaint was with the mushrooms. Mikey described them as “small, and harder to find than a buffalo at a petting zoo.” They were also a little on the dry side, which was surprising considering the fact that they were cooked underneath the cheese. We were also a little put off by the fact that the pepperoni was cooked underneath. It was good quality, but without being on top, it never got the chance to get that crispy, greasy texture that we love in our pepperoni. 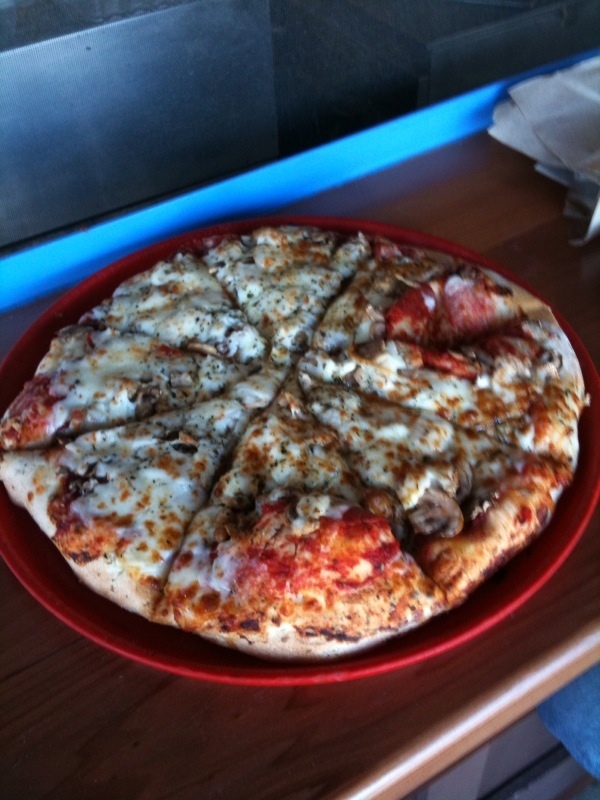 Mikey called this pizza “great” in comparison to all of the others we’ve reviewed for the site. 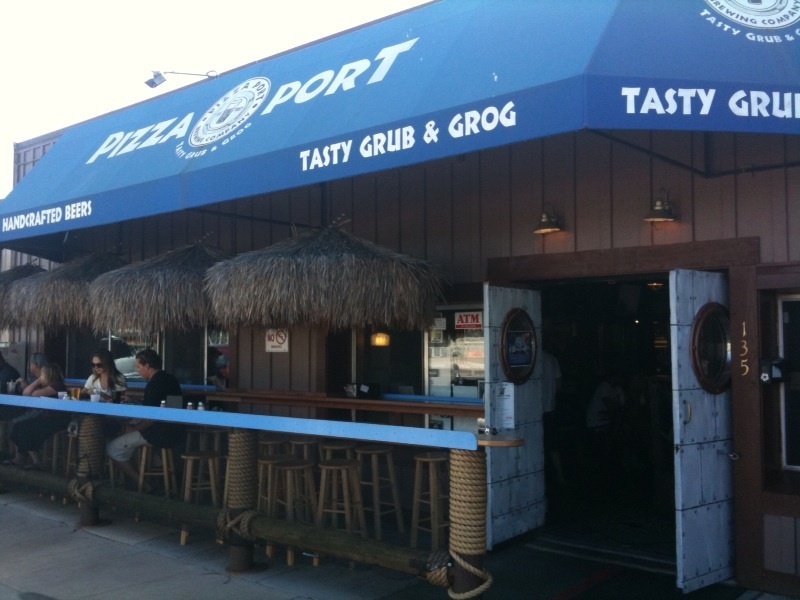 He really liked the place, but expressed a wish that the inside be slightly cooler than “Lucifer’s jacuzzi.” As for me, I really enjoyed Pizza Port. We made some great new friends, drank some quality beers and ate our best pizza yet. The only reason why I couldn’t give them a perfect 10 overall was the fact that they weren’t within cab distance of my house. Open up a Thousand Oaks location and then we’ll talk. On second thought, I’ll just move. If you go to Pizza Port on a Thursday night, be sure to get in on their free beer glass promotion. 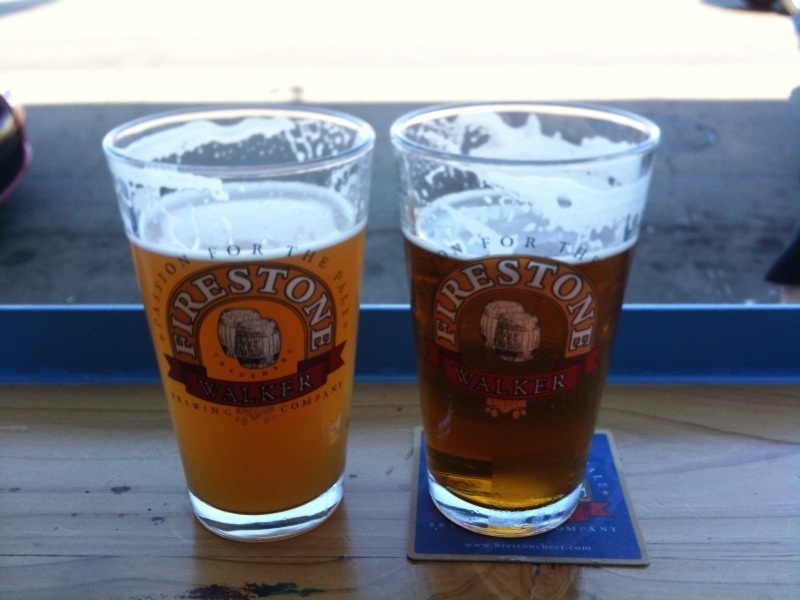 $5 bucks gets you a pint of their featured brewer (Firestone in our case) and a free pint glass to take home with you. These things are sturdy, manly-man drinking vessels and are pretty freakin’ classy too. Plus, as far as I know they’ve never featured Coors or Pabst Blue Ribbon, so you know you’re going to be drinking the good stuff. Hey! This is like my fave spot in Solano Beach! There is a great sushi spot right near it as well! I am always in Encinitas, solano beach area because my parents have a condo there. Pizza Port is fun! How funny! I was just here on Saturday night. The pizza was pretty damn good, but I felt that they put toooo much sauce on it. Also, I would like to comment on how HOT it was inside. I was sweating like a whore in church. I’m sure it didn’t help that the place was absolutely PACKED.